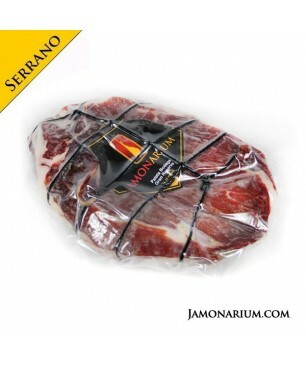 Joselito Gran Reserva Bellota ham is considered the best ham in the world. Joselito hams are from the area of Salamanca. The pig has been only fed with acorns and pastures. The ingredients used for its preparation are pork ham and salt. It does not contain any preservatives, neither chemical additives, gluten or lactose which makes it suitable for everyone. Joselito Hams are unique in flavor and characteristics. Its flavor is soft, delicate and a little sweet. Its caña is long and stylized and the meat is bright, with color between red and purple. Its fat is unctuous which melts in the mouth, of a nice aroma, fluid and intense of prolonged flavor. An incomparable Bellota ham! Health Joselito hams are rich in proteins and contains vitamin B1, iron, zinc and magnesium. Without chemical additives. Nutritional values Energy value: 1476 kJ / 355 Kcal, Proteins 26.9 gr, Carbohydrates -0.8 gr (0gr sugars), fats 26.3 gr (of which 8.1 saturated, 15.5 mono- unsaturated and poly-unsaturated 2,7), Food fiber 0 gr, Salt 3.7 gr. The sliced Iberian ham (cebo) is presented in thin slices and vacuum-packed in sachets. This is the easiest way to eat a delicious ham. It can be stored up to 6 months in the fridge or in a cool place. Curingtime more than 24 months. 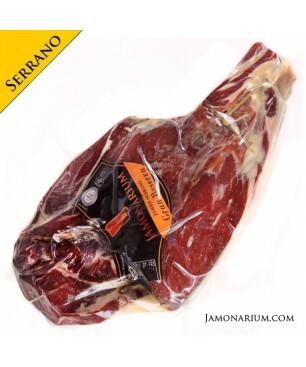 Outstanding product among the Iberian hams.Sold in a 100gr sachet.